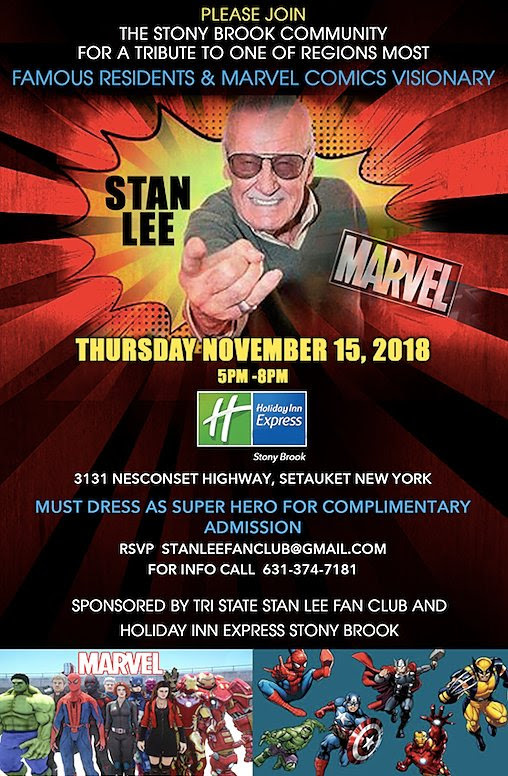 Owner of the Holiday Inn Express, Stony Brook and Three Village Community Activist John C. Tsunis will be joined by President of the Tri-State Stan Lee Fan Club Charlie Ziegler, Stony Brook Community Leaders, Stony Brook University students and marvel enthusiasts, dressed in costumes of the famous Marvel characters, on Thursday, November 15, 2018 at 5PM. Mourning fans, enthusiasts, and community members will light candles in honor of Lee, who died at age 95, as a Long Island Icon and the most famous member of the Stony Brook community. The hotel will be showing his movies on all televisions in his honor. Lifelong Marvel fans will show off action figures, comic books, collectible items and more which are often-considered relics and one of a kind. The first I-Con, where fans were dressed as Marvel Characters and traveled the campus, was held at Stony Brook University.